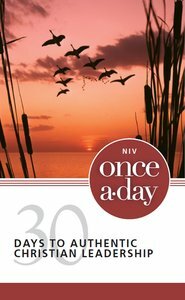 About "NIV Once-A-Day 30 Days to Authentic Christian Leadership"
The NIV Once-A-Day 30 Days to Authentic Christian Leadership ebook helps you develop a daily Bible reading habit centered on the topic of leadership. The path to true, biblically-based leadership and success comes through knowing and understanding the principals of authentic leadership laid out in the Bible. This 30-day reading guide will give you a head start on implementing these principals in your daily life. And, to help you develop your leadership skills with a biblical focus, each reading also includes an insight from outstanding Christian leaders of the past and present. Spend a month with God, learning what his Word says about leadership, and transform your effectiveness as a leader forever.